The tall, inclined upper walls, with their expansive ornamentation, and large entryways and windows were built to resemble pre-Columbian Mayan temples from the seventh century. It was the first of many Mayan Revival houses and structures that Wright built around Los Angeles and the world, and it is the subject of artist Clarissa Tossin’s Ch’u Mayaa, a 19-minute video (a five minute portion is embedded above) that depicts traditional Mayan dancing in conjunction with Wright’s famous foray into Mayan culture, and was first commissioned by the City of Los Angeles Department of Cultural Affairs. To Tossin, the Mayan origins and inspirations for the building are often overlooked, ignored, or misinterpreted. “The idea was to make work that appropriates the building back and asks that this work of architecture be discussed in the context of a lineage of Mayan language,” she told Art Sy last year. Ch’u Mayaa—which was exhibited at the Whitney Museum’s recent Pacha, Llaqta, Wasichay show—infuses explicit Mayan tradition and culture back into a house designed for western consumption. Crystal Sepúlveda, the choreographer and dancer, performs a dance based on gestures and postures found in ancient Mayan pottery and murals. The name of the piece, which translates to “Maya Blue” hearkens to an ancient popular pigment often found in Mayan pottery and murals. By performing these movements atop Wright’s building, Tossin essentially flips the narrative. How would Mayan people deal with and express themselves in this building? What if it weren’t a house, but was used as its inspirations were intended to be? Tossin also installed a series of sculptures for the Whitney show that depicts portions of the Hollyhock House’s interior with different body parts emerging from them. For those, the artist overlaid silicon plaster over sections of the interior and then peeled them off to create replicas of its interior. It’s a stark contrast—the hands and feet intertwined with the building—that seems to suggest that to Tossin, the Mayan influences are yearning to be recognized and freed from the building. Moreover, the video depicting dancing and the poised and intentional positioning of the body parts serve another important function. While Wright’s style borrows heavily from pre-Columbian inspirations, it ignores modern-day manifestations of Indigenous American cultures. Tossin explained in the museum’s guided audio tour that the reexamination of the history of Hollyhock House is particularly salient given the fact that Los Angeles has a substantial Mayan population that even still speaks the language. This decision emphasizes a huge defect in the Mayan Revival style. How can one revive a culture that is alive, thriving, changing, and interacting with the world around it? In fact, this fundamental question permeated Pacha, Llaqta, Wasicha—a title that uses the Quechua language, the most widely spoken indigenous language currently in use in the Americas. In the Whitney’s first exhibit to only showcase Latinx artists, each contributor grapples with and informs current manifestations of Indigenous culture. 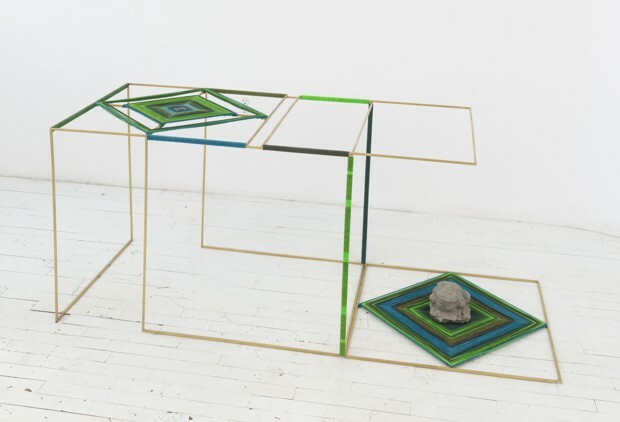 For example, the artist Guadalupe Maravilla’s series “Requiem for a Border Crossing” drew inspiration from 16th century maps that highlighted migration paths, grazing routes, trips to nearby population centers and more. Maravilla’s maps, however, track his own migration route from El Salvador across the U.S. border when he was a child. And the work isn’t entirely his own—it’s a collaborative effort between he and other undocumented immigrants, including his father and a student facing deportation. 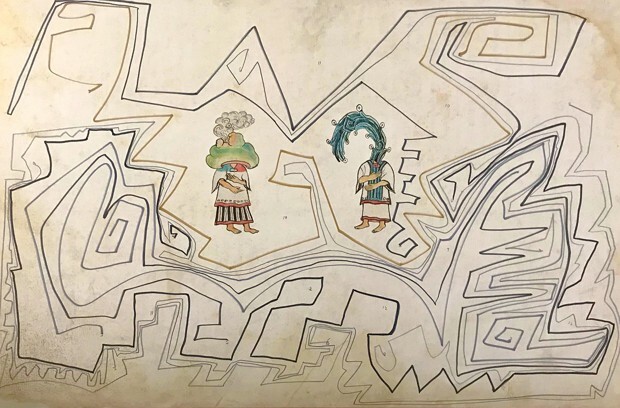 By using ancient maps to depict a border crossing, he highlights the irony of the dangers involved in crossing arbitrary borders that one’s personal culture potentially predates. Works like these, and Claudia Pena Salinas’ section of the show which depicts a contemporary interpretation of two Aztec water deities, Tlaloc and Chalchuihticue, illustrate how Western representations of indigenous American cultures relegate them to pre-Columbian exotic relics rather than living, breathing mores that speak distinct languages and have cultures that interact with and inform our modern reality.